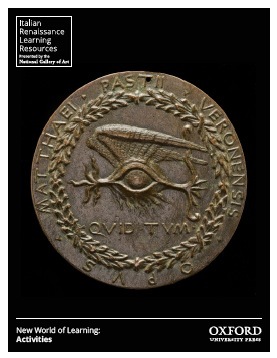 The Medal: The Renaissance Calling Card (Intermediate / Advanced) – The medal was an important part of the Renaissance visual vocabulary. It allowed for one’s sense of self to be presented in a small format for distribution to friends and people in positions of power. Rulers, intellectuals, wealthy merchants, married women, and widows are all known to have commissioned medals. This activity looks at a variety of Renaissance men and women in different levels of society and the kinds of medals they may have ordered for themselves. A Room of One’s Own: A Studiolo for Modern Times (Advanced) – This activity asks students to consider the Renaissance studiolo. It was a room designed for contemplation and study, but it was also a space meant to project an image of learning, customized for a specific individual. Intellectual for Hire: Constructing a Web Site (Intermediate) – Renaissance intellectuals, who typically acquired knowledge in many subject areas and mastered a number of skills, worked for a wide range of patrons and advised on a diverse set of projects, from commemorative poems to thematic programs for visual artists to the design of city defenses.